The Washington Post reported something interesting on Feb. 14: A farm in Virginia put up a sign saying “Resist white supremacy.” And it incurred a surprising amount of online backlash. In fact, this column will argue that online intolerance and attack have been Japan exports. First, let’s talk about the old hat. It’s been well established in both articles and lawsuits that Japan’s online bullying is rife (see “2channel, the bullies’ forum,” JBC, Feb. 3, 2009), with people libeled and doxxed, and many a personal and professional life destroyed. But it’s not limited to Japanese-language forums. Anyone critical of Japan gets it, and in English, too. This supremacist bile is common in the Oort cloud of online haters — the habitues of message boards such as 4chan and Reddit, who swarm, thrive and mobilize in anonymous echo chambers. Even mass murderer Anders Behring Breivik, the neo-Nazi who killed 69 people at a Labor Party island youth retreat in 2011, is an ardent Japanophile. In his manifesto, he specifically praised Japan as “a model country” for avoiding multiculturalism. Supremacists see Japan as a viable national alternative, not only because Japan can get away with policies that embed racism and keep immigrants out, but also, more importantly, because Japan gets the acceptance and respect of other rich countries regardless. Japan’s incubators of hate have returned the favor, offering templates for supremacists worldwide to convert their trolling into real political power. According to Joshua Green, in his bestselling book “Devil’s Bargain,” Bannon harnessed the power of online white male hate, “a rolling tumbleweed of wounded male id and aggression.” Recruiting “rootless white males” from the online gaming community into propaganda outlet Breitbart (the “crown jewel of the alt-right’s media universe”), he is now spearheading an international racist social movement. These rootless white males find succor in Japan. They enjoy one of the world’s largest gaming communities. 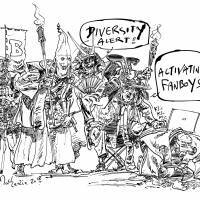 They are taken in by narratives of subservient women digging white men (The New York Times opined that “exclusively dating Asian women is practically a white-nationalist rite of passage”). And in the land of the hikikomori (extreme antisocial recluses), they find a society making allowances for awkward, introverted people who communicate best without ever leaving their room. They also find purpose. As noted above, if anyone is critical of Japan’s nerd terrarium, they pile on, like white samurai. Even though by doing so, they encourage the discrimination that affects them adversely. The white samurai now join the ranks of the other historical figures who have defended Japan from charges of institutionalized racism. They join the academics, who are compelled (by the “chrysanthemum club” old guard who explain away Japan’s racism as misunderstood cultural foibles, and by the Japanese institutions that fund their departments) to stick to talking about the “nice things” about Japan. They join the international diplomats and businessmen who seek to preserve “the relationship,” and prioritize trade over human rights. They join the Japan culture fans, who know a lot about a stripe of Japanese culture (e.g., anime and manga, martial arts, etc. ), but don’t want the overall reality of inequality and exclusionism to darken their dreamy day. As cottage-industry “Japan experts,” they promote false moral equivalencies, diverting attention from serious stuff and focusing instead on Japan’s exotica and erotica. They all pile on against the pragmatists, who, as foreign residents of Japan, are just trying to deal with the day-to-day, earn an honest crust and avail themselves of opportunities other Japanese have. But if they ever advocate equal opportunity or access, they face the harshest criticism from their own kind. They don’t belong in the ethnostate. 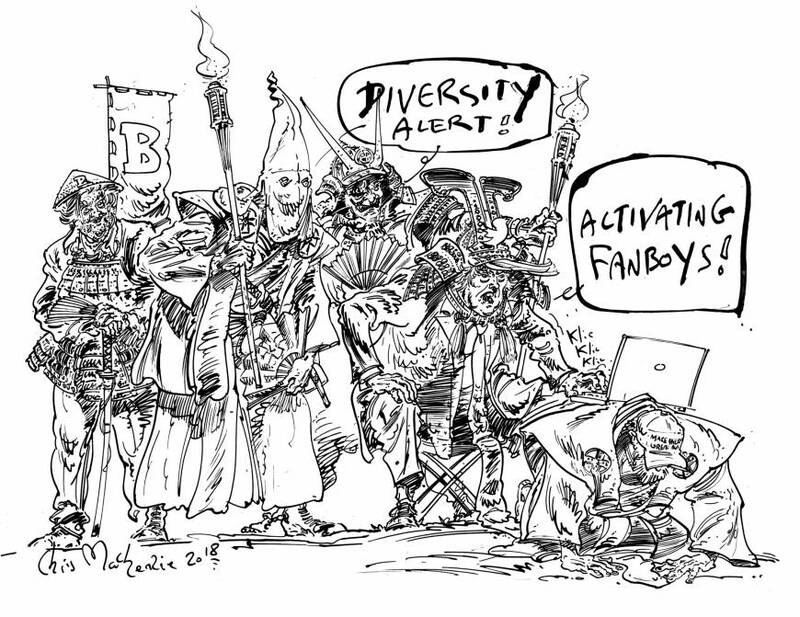 The white samurai are the most powerful of these detractors: anonymous in identity, instantaneous in response and single-minded in purpose, as the true keepers of a hate-based faith. The biggest loser in this dynamic is actually Japan. Even the United Nations’ special rapporteur on racism noted in 2005 that Japan as a society is “closed, spiritually and intellectually centered.” And as its population dwindles due to its antidiversity policies, its economic power and international clout will too. And the biggest takeaway from all this is that one cannot ignore racism. As argued umpteen times before, ignoring discrimination only helps it spread. Likewise, ignoring Japan’s incubators of hate for all these years has finally culminated in its watershed moment: Online hate helped America elect a racist president. Now it is undermining liberal democracies worldwide.